Free Acid Value = 30, 50 or 70 *Learn about FAV here. Chemical peels are great for use as: Anti aging treatments, Acne treatments, Scar treatments, and to re-freshen the skin periodically. Glycolic has a small molecule and can penetrate into the skin very easily. Excellent results can be obtained by using glycolic peels weekly or bi-weekly. Expect mild flaking (peeling) to begin on day 3. Glycolic is one of the most common alpha hydroxy acids. Its popularity stems from its extra small molecular makeup. 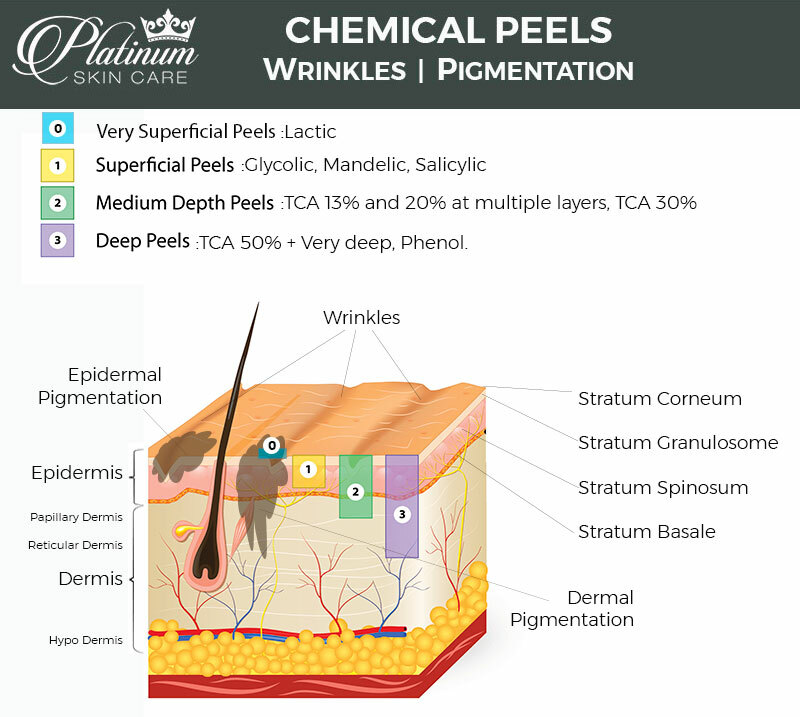 The tiny molecules can penetrate easily into the skin giving most people a great sloughing action after they perform a peel. Glycolic acid is a great "general" type of acid. It is water soluble, and works nicely on most skin types. Glycolic Peels are the "Official Lunch Time Peels". The first readily available acid in day spas that started the chemical peel revolution! Level 1 Glycolic 30% (2.1pH) - First time at-home peel users with non-sensitive skin. Level 2 Glycolic 50% (2.1pH) - Looking for more results than the 30. Previous professional peels. Level 3 Glycolic 70% (0.6pH) * Warning for diluting or body use only. Who should be using the 70%? Have been using buffered glycolic peels for years and are looking for a lower pH level. Dilute to desired percentage (10% - 60%). Want to treat their body. Pigmentation, scarring, mole removal and more. The 70% can be used full-strength for these reasons. With glycolic acid there is only a light amount, to no visible peeling. Glycolic is considered a Superficial peel. It can penetrate through the Stratum Corneum, the Stratum Granulsome and into the Stratum Basale layer at higher strengths. Peeling should be completed within 3-7 days. There is not truly any "down time" related with this acid. You may consider a bit of dryness "social downtime". The absence of flaking does not mean that it isn't working though. Flakes are not necessary for changes to occur within the skin. This is the perfect peel for someone that wants refreshed, new and glowing skin, but doesn't want to deal with the dryness and flakes a stronger peel will have. Continual use is recommended for best results. You can apply this peel one time every week or every second week until a series is completed. Then as needed, or monthly. Alpha hydroxy acids are considered OK to use during pregnancy and during breastfeeding (lactation). Once your skin has acclimated to the 50% you may want to try a TCA 13 for more visible peeling. View our simple glycolic chemical peel demonstration. Watch a body peel demonstration with TCA 30% versus Glycolic 70% on the hands and arms. Wash face with acidic cleanser. Dry and apply 1-2 layers of Peel Prep Solution A. Apply peel for suggested time frame on direction sheet. Rinse well with cool - cold water. Glycoic Peels 30 - 50:Glycolic Acid Ultrapure (tm) , Purified Water, High Purity Glycolic Acid, Ammonium Hydroxide, Glycerin, Propylene Glycol, SD Alcohol 40B, Menthol Crystals, Hydroxyethylcellulose, Benzyl Alcohol, Disodium EDTA, Allantoin, Panthenol, Methylisothiazolinone. pH of 2.1. Glycolic 70 - Glycolic Acid Ultrapure (tm) Deionized water, (70% unbufferred pH 0.6) Ultrapure Glycolic Acid, Glycerin usp, Hydroxyethylcellulose, Panthenol Methylisothiazolinone, Benzyl Alcohol. I am in my mid 40's & have been using this product for at least 4 years now. The look & feel of my skin is amazing. Each time I use the at-home peel I feel as if I am getting the results of an expensive microdermabrasion treatment! Be advised that for first time users I would start with minimal time & work yourself up. I have dry skin & use the emu oil afterwards with great results. This home chemical peel is good for softening fine lines & age spots but will not completely rid of them. You may wish to speak with a consultant about a stronger peel if those are your desired results. This is definitely a good place to start. I use this to maintain healthy skin and couldn't be happier. *Results vary depending on individual needs and product usage. Please see us for personal recommendations. VERY PLEASED I ordered my first glycolic facial peel from your site about 3-4 weeks ago and am thrilled with my results so far! I am 29 years old and suffer from hormonal acne (especially after having two babies in 19 mos and breastfeeding) as well as freckling and sun damage. After 3 one layer 30% peels at the reccomended times and a fourth with two layers per the included instructions my skin is very clear, smooth and the sun damage, freckles, acne scars and uneven tone are definitely improved. I had very little sensitivity and noticed light peeling that was easily addressed with the emu oil and moisturizer with sunscreen. I am going to move up to the bi phasic peel to try and get at some stubborn blackheads on my chin and nose and will keep ordering from this company! *Results vary depending on individual needs and product usage. Please see us for personal recommendations. This product take of my acné. :) *Results vary depending on individual needs and product usage. Please see us for personal recommendations. TRULY EFFECTIVE FORMULATION I've purchased other chemical peels online and been sorely disappointed. I do feel that this company makes the best at-home peels. They are as effective as any in-office peels I've received. I've used the 60% peel in the past and currently use the 50%. They just plain get the job done quickly and layer nicely for deeper penetration. My only complaint is that the 60% with the pH of 2.1 is no longer available. Diluting the 70% is not a viable option because the pH does not rise and it is just too irritating and strong. *Results vary depending on individual needs and product usage. Please see us for personal recommendations. ONLY THING THAT WORKS. This is the best skin peel. I works beautifully to keep my very oil, very acne prone 38-year-old skin clear. The only time I break out is when I forget my peel. Thank you for this product! *Results vary depending on individual needs and product usage. Please see us for personal recommendations. ECZEMA USE WITH CAUTION I first purchased this product 2 years ago and it does work very well. I did it exactly as the instructions stated and followed with a copper peptide. However, last June I started to have a red bumpy, itchy rash under my nose. I kept putting steroids on it to relieve the pain. I finally went to the dermatologist who informed me that it was 'induced eczema'. He explained that people have eczema and may not know it until their skin is completely irritated then it will come out, which is what using this peel did. So, I caution you when using it. It works well, but do not use over long periods of time. *Results vary depending on individual needs and product usage. Please see us for personal recommendations. AWESOME I use the 30% glycolic peel along with the 3% salycilic mini peel. The results are wonderful on my oily acne-prone skin. It helps keep my skin clearer and has helped with the fine lines that have started to crop up! I love Platinum Skincare!!! *Results vary depending on individual needs and product usage. Please see us for personal recommendations. GREAT PEEL - USE IT WITH 15% SALICYLIC I bought both the 15% salicylic and 50 glycolic peels. I worked mostly with the salicylic for several weeks and then decided to try the glycolic to help with the dryness the salicylic was creating. Peeling was minimal. At my next peel i did the salicylic peel and then the glycolic, back to back. this was too much for my skin. I could hardly touch or wash my face. Peeling was moderate and i noticed great results after a week. i haven't tried the dual peel again, but i love just the glycolic alone. i don't notice peeling as much as the salicylic and my face feels softer after a week. Going to try other peels to see how they work! love these products! *Results vary depending on individual needs and product usage. Please see us for personal recommendations. LOVE THIS PRODUCT! I am 48 years old, and I faithfully used this peel for the recommended 8 weeks. It took the whole 8 weeks to see a big difference, but my skin is definitely brighter, the wrinkles have decreased, and some of my scars have even diminished. My face feels polished and my pores don't clog up like they used to. I had minimal peeling. I'm sad that my 8 weeks are up and I have to back off for a while! I plan to try the TCA peel this fall to try and tackle some old acne scars and childhood scars. I would like to know what does Platinum skincare recommend as a daily or nightly cream to keep my results up until I do another peel? Love Platinum skincare products!! *Results vary depending on individual needs and product usage. Please see us for personal recommendations. Platinum Skin Care Glycolic Acid Peels | Which Percentage | Who is it for?